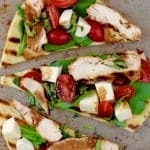 This Grilled Chicken Capese Flatbread is just about as easy as it comes and packed with delicious flavor! Perfect for weeknight grilling! To make balsamic reduction, heat the vinegar and honey over low heat, stirring regularly until it reduces to about 1/3 its original amount. It should be thicker and will continue to thicken after it cools. Grill the Gold'n Plump Tomato Basil Seasoned Boneless Skinless Chicken Breast Fillets over medium heat, turning half way through until they are fully cooked and have an internal temperature of 165 F. To keep chicken extra juicy, let chicken rest 5 minutes before slicing to top flatbread. Grill the naan bread over medium heat for about two minutes on each side. Top each piece of naan with a little spinach, then the tomatoes, the mozzarella, the chicken, and finally the basil and a small drizzle of the balsamic reduction. Cut, serve, and enjoy!